So… Jarvis Jones to Seattle. Could it happen? Should it? Would it be ethical for Seattle to take Jarvis Jones? It just seems so unlikely that the Seahawks would draft Jarvis Jones if he made it to the #25 pick. Pete Carroll and other members of Seattle’s coaching staff were at USC when he was told by the school’s medical team that he should cease playing football to avoid life threatening injury. He has spinal stenosis, a condition that has cut short many promising careers. Although it’s highly unlikely a scrubbed up Carroll was the guy making that particular judgement, imagine that scenario for a moment. You’re part of an organisation that warns a player he should stop playing to avoid possible permanent and serious injury. Then when he turns pro, you offer him a contract? The ethics don’t add up there. Having said that, someone is presumably going to give Jones the opportunity to play professional football — whether that’s as a first round pick or a seventh round pick. And that team will have to clear him to play, just like Georgia did and USC didn’t. The NFL teams will do their own tests. Their doctors will offer up their own take. I’m not going to pretend I have any insight into the specifics of spinal stenosis, but Jones has argued that he only suffers from a mild case and it won’t be an issue. That might be wishful thinking. Yet since he started competing in the SEC, he’s not had any neck or back injuries. He’s been banged up and missed games (plus the combine), but there haven’t been any red flag moments where you start to fear that he’s putting his life at risk. Some teams will possibly hear the word ‘stenosis’ and take his name immediately off their draft board. Others will take their chances based on the information they receive. It does seem a little crude to even use the words ‘take their chances’. We’re talking about a man who could be left with life-threatening injuries if this condition is as serious as USC suggested. And that’s why I keep coming back to whether Carroll would want to be the one to make the call. Him drafting Jarvis Jones just seems all the more risky. He’s the one who probably sat in a room with those doctors when the call was made to prevent him playing any more football for Southern Cal. If Jones did suffer a serious injury in Seattle due to the stenosis, how bad what that look? I suppose if the Seahawks’ medical team see things differently and clear him physically, then it becomes somewhat of a moot point. After all, nobody is forcing Jones to play football. They’d be able to point to the tests and say they did their homework. Carroll would be well within his rights to explain he’s a coach not a doctor and that he was acting only on the information presented to him. You can see why things might get a little awkward though if something went wrong. The stenosis is likely to drop Jones down the draft board, although it’s not the only reason why he probably won’t be a top-ten pick. As dynamic as he’s been in the SEC for the last two years, there’s still a lot of frustrating tape out there. You can’t help but watch the SEC Championship game against Alabama and scream, “Get off that tight end!” Get off the block and make a play. He couldn’t. Even when he had a big impact (eg, Missouri), there are frustrating moments where he’s easily managed. I think he’s a naturally gifted football player and athlete with a nose for big plays, but he’s not necessarily the most natural edge rusher. I know that sounds strange given his sack numbers, but it’s difficult to explain. Look at the tape below and you’ll probably see what I mean. There’s no getting away from his production in college. For the last two seasons, he’s been statistically one of the best players at any position. Only Whitney Mercilus topped him for sacks in 2011, but he led the country in 2012. That’s two solid years of pure production in the SEC. He had an astonishing 24.5 tackles for a loss in 2012, with a further 19.5 the previous year. Throw in nine forced fumbles and an interception and it’s easy to see why teams will be hoping he checks out medically. It’s easy to rule Jones out at #25 due to the medical history involved with USC. But what about the argument that suggests it still remains a possibility? Pete Carroll has been very open and honest when discussing the teams needs going into an off-season. In his end of season press conference in 2011, he singled out how important it was to improve the 31st ranked rushing offense. So what does he do? He goes out and drafts the left tackle from the best running team in college football — Alabama. The guy who created rushing lanes for Mark Ingram so that he could win a Heisman. James Carpenter was the teams first round pick. They then go back and add a road-grader type with their second choice in John Moffitt. The intent was very clear and with hindsight, both picks made absolute sense. Yet at the time nobody called it. A year later and Carroll is speaking about the next batch of needs. He highlights speed among the front seven as a key focus. Then he goes out and selects the fastest defensive end in the draft — Bruce Irvin. He follows it up with one of the fastest linebackers — Bobby Wagner. Again, with hindsight if you took Carroll’s remarks literally both picks were fairly obvious. He did what he said he was going to do. By the book. And now the focus is improving the pass rush. Carroll has spelled it out again, just like the last two years. It’s a safe bet that he’s going to draft for the defensive line to improve the pass rush. I sat down last night and looked at a long list of defensive ends and tackles. I could see a handful of likely options. But one name stood out. Carroll has been extremely literal with these hints, he’s made everything clear. He wants to improve the pass rush this off-season. Statistically, who has been college football’s best pass rusher the last two years? Yet just when you think — hey — this makes perfect sense, you almost have to take a step back. The doctor told Jones he would be fine and he could play again. But the Trojans’ team doctors thought the injury was much more serious and refused to clear him for contact; they eventually recommended that Jones retire from football. So the then-20-year-old spent his days wandering from class to the basketball gym to the weight room. USC doesn’t just turn away top recruits on a whim. Could it be argued that the first doctor wasn’t speaking from a completely qualified position? That perhaps he didn’t have the full facts at the time? If you’re told everything will be fine one minute and then you need to retire the next, it’s harder to accept. You’re getting mixed message. Ultimately, USC made a difficult judgement. They were ending his dreams. You don’t take matters like that lightly. And yet I appreciate why Jones fought to continue. Conn also spoke to Ken Norton Jr. — now linebackers coach in Seattle, but in 2009 he was the main reason Jones chose to play for the Trojans. The coaches were aware of the situation. Carroll and Norton left USC for Seattle a matter of weeks after the decision was made, but you have to believe they were right there — maybe even breaking the bad news to the player. For those same coaches to then offer him a pro-contract a few years later just seems unethical, doesn’t it? Would Jones play the WILL in Seattle? This isn’t a 3-4 scheme and the roles are different. Would he play the LEO? He doesn’t have the natural length that would make that an obvious fit. And yet he’s been the most productive pass rusher in college football the last two years. Wouldn’t you just have to find a role for the guy if he is cleared medically? However big that if may be? Stranger things have happened. The biggest priority will remain a defensive tackle for now, unless that matter is addressed in free agency. It’s one of only two positions on the roster (along with the WILL) where the Seahawks are scheduled to lose a starter. Yet this is a team that has taken risks. 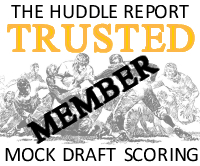 Trading for Marshawn Lynch, Charlie Whitehurst and Lendale White were risks. Drafting Bruce Irvin was seen as a risk. Drafting a 5-10 quarterback and making him the starter was a risk. Trying out Terrell Owens and Braylon Edwards was a risk. So was flirting with the idea of trading for Brandon Marshall in 2010. This would be a completely different risk given the extremely serious consequences of it all going wrong. The question is, would this risk be too much even for the Seahawks? I know it’s been mentioned the history of Pete having been at USC when the diagnosis came in. And that it was would be that medical history that would prevent them from taking him. Obviously, these are medical opinions. And I’m not sure what the liability of USC would be — but it’s a private institution. I would expect that the discussion of liability and risk to the school would have been discussed rigorously following his diagnosis. USC wouldn’t be a school backed by a state budget for these kinds of things. There is also the question of whether or not the opinion is valid. Obviously it’s a case where you won’t know if it’s a problem until he suddenly can’t walk anymore. But it’s also not just a black and white: A or B situation either. I don’t think that it’s necessarily indicative of anything in terms of what Pete would consider — by the fact that the USC medical team wouldn’t clear him. Pete isn’t a doctor. We don’t know how those discussions went down. We also don’t know if he even regarded that opinion very highly. Pete certainly would never be allowed to override a medical opinion. So I wouldn’t say that his conceding to that lack of clearance amounted to agreeing with is. He would be obligated to abide by it. I’ve not heard Pete say much about it at all really. And if I were a coach who didn’t agree with that decision and harbored hopes of that player slipping, I’d pretty much not say anything too. I understand USC wasn’t in a position to risk playing him and wasn’t in the business of turning away talent. I would leave room however that there could have been other factors that entered into that decision. I just am left to wonder just how much Pete concurred with the University’s decision. If Seattle’s staff green lighted him, would that be sufficient? That final sentence is the one I’m wrestling with. Took the words right off my keyboard. For all we know Pete Carroll had literally no input in the decision to shelve Jarvis Jones. Pete Carroll’s opinion carried a lot of weight at SC, but try telling that to the insurance underwriters. The question of ethics is an interesting one. On the one hand you have Jones, who wants to play football and on the other you have the opinion of probably some really good doctors. Shouldn’t we assume Jones understands the risks that he is incurring? And if so, that he is capable of making a free will decision in the matter? To me, all the guys out there are taking a substantial risk, so what if his is a little greater? If the rumor of Jones stenosis being ‘mild’ is indeed true, and if a ‘mild’ case is as tepid as it sounds, sure, sign him up. I’d probably want him to sign a waiver too, though. I’m assuming plenty of doctors will take a look at Jones. I’m assuming the Combine doctors looked him over. By the time the draft rolls around teams should have a good idea of the risk/reward ratio and whether they’re willing to take the risk for the reward. I could care less what any Georgia doctors say, or what any USC doctors say. Irrelevent. The Seattle medical staff is among the finest and it will be very difficult to determine how severe the case is with Jones. If you could get 5 years out of Jones, would it be worth it? I think so. Personally, I’m not sure it is anymore a risk than any other player has on the field. But what if in the 6th year he suffers a life threatening injury? Surely that’s the point here? It’s not about how much we can milk out of the guy. It’s about whether we should be taking him at all. And that’s why we must consider what USC said previously — because none of us will be privvy to what the Seattle doctors diagnose. We can play ‘what if’s’ all day. If the docs. determine he could have a severe injury at any moment and Seattle takes him off their board, fine. But like you mentioned above, no one is forcing him to play NFL football. Is it morally correct to put a player on the field with a condition that could potentially kill him? No. Not at all. It isn’t morally correct to select players high in round one who abuse their girlfriends and act like jackasses off the field. We’ll see what happens. I’m not advocating “milking his career” but he is a grown man making grown man decisions and earning grown man money. Rob, if we don’t take him, chances are someone is going to. The kid is going to play football whether we draft him or not, and while I acknowledge the injury he has increases his chance of something bad happening, every player in the NFL could be one play away from a life threatening injury. Johnny Knox didn’t have a stenosis issue, but still got messed up playing against us, and is now out of the league. There are no garuntees, and if he (Jones) wants to play football, and hes on top of our board as a player, seems like you should take him. This is a potentially lethal injury, how is it not different from for example a bruised knee? Or even a mild concussion? Rob is right, there’s more to this than simply “milking him” for his talents on the field. Bottom line to me is he knows the risks and could go to war at his age if he chose to… if he wants to play it should be all on him quite frankly as tragic as these injuries could be. That said I do not feel that there is any ethical violation with the above scenario. USC not unlike what the NFL is experiencing now, can not ever be seen as having been in the position wherein there is knowledge of potentially “life threatening,” medical diagnosis and continuing to allow said athlete to play. Just like the NFL has to consistently state it’s message of player safety now to obscure the fact that it may have known for years that repeated blows to the head, knees, organs, and spine would/could debilitate a player long after their career is over. The whole sum of the sport that we all watch constantly lives in the grey that is athletic marvel and violent combat. Even now, gearing up to draft time, ESPN continually plays the highlight of Jadeveon Clowney destroying his opponent in some meaningless bowl game. Your sentence “what if in year 6…..?” presents a very valid concern, one that a rational person would have to wonder, but leaves open the possibility that Seattle and for that matter any team should ever sign/draft/pursue any player with major health issues, including thoughs that we deem less then life threatening and perhaps able to stomach as that they fall into the cosmetic, for lack of a better word. Example, I truly believe that Seattle should draft Marcus Lattimore in the 6th round. I also truly believe Marcus Lattimore will be using legs filled with artificial ligaments and joints by the time that he is 40 and if modern science doesn’t catch up will most likely be in a wheel chair do to crippling injury induced arthritis. I also fully supported the near hackneyed idea of signing Peyton manning, last off season when no one could rightfully guess as to whether or not one devastating sack would cause him to be an invalid in his right arm for the rest of his life do to severe nerve damage. Would it be unethical for us to draft Lotulelei after his operation as that the Seahawks staff were not the one’s who initially diagnosed his condition? Is it simply okay to draft someone like Jones or Lotulelei as long as you were not connected to them before hand? Point is, I for one absolutely believe and respect the idea of ethics in decision making, but I do not see it as an ethical violation without knowing the whole sum of USC’s-and-Carrol’s thought process (and we may never) for Pete Carrol and the Seahawks to draft Jarvis Jones. Playing football is risky, period. If most of us were in his shoes, we would want to play in the NFL too. For me when I make $100,000 a year it was a good year. For a potential 1st round draft pick they make what, $1,000,000 a year plus. That is ovrer 10 times as much money as I make and that is only his rookie contract. If I could play NFL football and worse case make 10 times the income my only question is where do I sign? Sure there are risk on the football field, there are also risk in my office of dropping dead of a heart attack because of the stress. Somebody will draft him and they will pay him big money. If he retires after only three seasons at the age of 27 he will be financially set for two lifetimes. Personally I would be thrilled if we drafted him at #25. Financially set and maybe not able to walk? That’s what we might be talking about here. And whether we like it or not, Seattle’s coaching staff has better insight into this injury than any other team in the league. They’re the only ones who fully know the extent of the USC medial staff’s report. On the other hand – He may not be able to walk someday, whether he plays football or not. If he walked away tomorrow he may end up crippled by age 30… it’s a gamble with degenerative diseases. Meanwhile you are denying him the most positive thing that he desires, to be a pro football player. We aren’t his mommy. Surely he should have some choice too. But lets just say that we are protective, no one drafts him, he isn’t allowed to play football. He will get a job somewhere. Perhaps with Obama care insurance won’t deny his pre-existing condition. He will at least get a minimal amount of coverage as he works his 9 to 5 and lives his life as we live ours. At least he’s alive right? Tough choice, but I think that he should be allowed to make that choice. I am curious whether there are any updates on Chris Polk? How did his season go? I think it’s up to the person to decide what he loves more: life itself, or what he does with it. I lot of people would rather risk dying doing what they love than just…existing. There’s only one way that Seattle will take Jones in any round of the draft: if the Seahawks doctors figure out the USC doctors were looking at some other guy’s X-Ray. It’s not about liability (I’m sure he’s willing to sign any liability waiver that’s put before him). It’s not about wasting a high draft pick on someone who might end up in a wheelchair. It’s not even about the medical “truth”. The fact is that USC’s medical staff have already stated their opinion that he’s at high risk of a life-altering injury. Any other doctor, in order to clear him with good conscience, must not only disagree with the USC staff. He or she must also be 100% confident that the USC medical staff is wrong. I don’t believe that any good MD will say: “I am 100% sure that Jarvis Jones is not at higher risk to suffer a catstrophic injury than any other player.” Nobody who has a valuable career will be willing to make such a high-risk call. The same is true for an NFL head coach and GM. If they go for Jones and bet wrong–he ends up in a wheelchair–that’s all they will ever be remembered for. That would even happen to Bill Bellichik. People would say, “Yeah, he won two super bowls–good coach–but awful human being. Did you see that guy he knowingly put into a wheelchair.” That’s the end of your career–and for a guy like Carroll, whose career is nearing its stopping point, the end of your legacy. The negative consequence of taking the guy and paralyzing him (however small the probability of that happening) is too great for the risk to be taken. So I say there’s no chance that the Seahawks gamble on Jarvis Jones or Walter Stewart (who might be even better than Jones). This is exactly what I was going to write, only not this good. This is not a medical issue, it’s an ethical one. Once two different opinions are out there you just can’t side with the most recent one. You also can not wash your hands from responsibility when it is you making the call to get the guy. It’s not even a low risk high reward situation. Other options at #25 won’t be UDFA quality. And I think Seattle’s insight into the stenosis when it was diagnosed makes it all the more challenging to draft him. Totally agree. We’ve got a great thing building here right now and all that could be poisoned by a preventable tragedy on the field. I can’t help but think that the potentially serious risks inherent to spinal stenosis would cause the coaching staff to either consciously, or unconsciously, treat him differently than other players on the team. For example, would he sit out full-contact drills that other players are asked to participate in? We don’t need any distractions like this, even for a chance that he might be “the guy”. To me there is no ethical question here he wants to play football, he can play football, several doctors feel that he is in good enough shape to play football. Is there a risk to letting him play yea there is, but there is also a risk for Payton manning to play with his neck issues, I bet there are doctors that would advise him not to play. People get paid far less to put their lives in much more risk at a younger age, with less medical care, then Jarvis Jones. Every player is at risk of one play ending their career, and lives on any given play some players are at more risk then others because of size, weight , age, or previous medical history if he is the best player you take him. I agree that the ethics question is the key issue. Unless a broad consensus of expert medical opinion clears Jarvis Jones to play, the Seahawks should not draft him even if he waives the risk. We don’t know how Ken Norton and Pete interacted with Jones behind the scenes. Were they genuinely supportive, or did Jones feel abandoned? The human touch is one of Pete’s strong suits, so I would expect that Jones was treated well and still trusts Pete to the max. He seems the ideal Leo, so if the medical staff clears him, and the relationship between Jones and Pete is positive, this could be the most talked about pick of the first round. In any event, I continue to believe DL is the way John & Pete will go. Here are the guys probably worthy of the first round: Sheldon Richardson, Star Lotulelei, Sharrif Floyd, Sylvester Williams, Johnathan Hankins, Kawann Short, Donte Jones, Bjoern Werner, Barkevious Mingo, Ezekial Ansah, Dion Jordan and Jarvis Jones. At least a couple of these guys will be there at #25. Plus, John may have an ace up his sleeve, someone like Tank Carradine, Bennie Logan or Brandon Williams. I think it is 90%+ that the Seahawks R1 pick will be one of these guys. I’m not at all qualified to speak about stenosis so I’m a bit unclear if he is more at risk for getting injured or whether the extent of a possible injury would be worse. It seems to me like the USC staff might have played the what if game and said if he gets hit wrong then he’s done. Maybe the Georgia staff looked at it like a hit the wrong way to anyone would mess them up so he is taking the same risk as everyone else out there but might not have the same chance at a recovery. To me, that scenario makes sense and that is not entirely going against the USC doctors and allowing him to play. It depends which side of the coin you want to be on. Anyone ever seen this Darren Fells guy play football? No… but he can dunk. What better target for a point guard quarterback? I saw somewhere that it is a 3 year deal… Seems a little unusual. Is it safe to assume that it’s a minimum deal with little to none guaranteed? It basically just means Seattle holds all the cards. Can cut him whenever, but if he works out he won’t be going anywhere for four years (3 in contract + 1 RFA). Fells played basketball at 245 lbs. Do you guys know how he ended up at 280 lbs. 35 lbs? How do you add that without gaining fat? As far as his highlight reel goes, he looks like an amazing rebounder. His stats back it up. Basketball plays requires a lot of precise running to pick, screen or get open. Route running shouldn’t be too hard to teach him as he was an all-state TE in HS. Fells was going to hold a Pro day for himself before he was signed today. I wish we had his measurement and measurables. I think when playing football becomes your job in the NFL, it’s a much colder perspective than it is in college. NFL prospects are looked at as investments and your measurables such as your 40, your strength, your injury history, and other traits are looked at as your viability as an investment. In college, football players are viewed as student athletes, and the goal is to get them ready for a great careers whether it would be in football or not. So in short, in college – unethical because they’re kids who have bright futures in front of them. In the pro’s – not unethical because they’re grown men who signed up for the job, but if you have a life-threatening medical issue you could be viewed as being a bad investment. I really don’t understand why the USC doctors wouldn’t clear him. If he only has mild stenosis, I really fail to see how his potential for serious neurological impairment would be significantly increased. The fact that he was cleared by both Georgia’s medical staff, as well as the NFL’s medical team at the combine really shows how unimpressive his condition is. This isn’t like the kid from cinci with cervical fractures. I expect a few ignorant GMs will move him back a round, but this really shouldn’t affect his stock too greatly. It doesn’t have to do with this issue but Seattle signs Darren Fells a basketball player to a 3 year contract as a TE, HeHe already making noise in FA. the guys height and on the story that got my attention was 6’8″ and 280lBs but in the measurables he was 6’6″ and 260lbs with 35″ arms, 4.53 in the 40, and 10.6″ hands. he did 10 yaed split and hes 27 year old with a 3 year contract. He’ll be a monster if he can play. As I’ve perused the web, I’ve seen Jarvis Jones going to many different teams from 2-15 in mock drafts. Every time I’ve seen him going that high it makes me wince because it takes very little to have a guy drop through multiple rounds. I don’t think he’ll go undrafted but I just don’t see him getting drafted in the top half of the first either and maybe not in the first round at all. This is an interesting year for risky players and he is an interesting player as he grades so high in football talent. Should we not include the LEO as well as the 3-tech and WILL as starting positions on defense that are up in the air? Can the Seahawks go into next season with their most important pass-rushing position under such a cloud of uncertainty? Clemons could be out for the entire season. He could be like Carpenter, come back too soon, and be ineffective. Unless they are sure, how can the Seahawks enter such a promising season with a player who has a $9 million cap slot and be unsure if he can even play much less be effective? It’s dirty pool to be sure, but unless you are completely confident in Irvin being a 3-down player next year, shouldn’t you consider cutting Clemons and going after a proven pass-rusher like Avril/Kruger/Bennett? It’s unlikely Clemons would be out for the whole season. The big issue is whether he gets back in week one or week seven. LEO is a need but they only spent the #15 pick on a LEO less than a year ago. I could see them going after a LEO in round one if it’s the best option among the remaining available players. As I’ve said before, because of the uncertainty about Clemons’ condition and Irvin’s slow development, the LEO is my biggest concern going into FA and the draft. While we can all hope that he makes a rapid and complete recovery, “hope” is not a strategy. I don’t envision the Seahawks spending the $$ it would take to sign someone like Avril, but I’d be gob-smacked if they don’t go after Osi or Freeney. And, I wouldn’t be at all surprised if they picked an outside pass rusher at #25 instead of a DT. I never really thought Jarvis Jones was even an option at #25 (thought for sure he was a top10 pick), then the whole medical thing came about and now he might possibly be out of the 1st round. For as much as I would pound the table for this guy at #25, our scheme wouldn’t really benefit him if he’s at WILL, that position is more of a sideline to sideline guy, much like Ogletree than Jones. Jones has the ability to pass rush, if it means him and Irvin splitting reps, I’d rather we fill our 3tech than draft two guys for one position. It looks redundant and a wasteful way to draft two 1st ROUND PLAYERS for one position. Besides, if this guy was available (say in the 2nd round), than maybe we try to move up (only if he passes the top10 picks in 2nd round) to nab this guy. Great player but too much risk health & scheme fit-wise in my opinion. It’s a very interesting dilemma. I agree with those who have said that the man is going to play football in the NFL. I don’t think there’s any doubt about that. And I would be shocked if he fell all the way to #25. Having said that, I don’t think you can just act like that solves the moral dilemma. I do see it as a moral dilemma rather than an ethical one. I think it would be ethical to take him and allow him to play for you if your team doctors clear him. You’ve got to be able to trust your doctors right? And ultimately it’s his decision to play. However, as a coach or a GM you know in the back of your mind that that tragic injury could still theoretically occur in that “6th year” as Rob points out. That’s where to me it becomes a moral question, because as the head coach or GM would have to live with that injury (in a sense) for the rest of their lives, just like the player. I mentioned about having to trust your team doctors, and that brings me to another point. One way to look at this situation in a clinical sense would be to say that the USC doctors’ prognosis is the exception. The original doctor mentioned in the story told Jones he would be fine and could still play. He said he sees this all the time etc. Obviously the Georgia doctors cleared him to play, and he did so without incident. Presumably (based on reports in the last day or so) several NFL teams’ doctors have approved him medically. With that many groups of doctors staking their reputations on saying he’s ok to play, I don’t think it necessarily makes sense to rely on the USC doctors’ prognosis as the fallback standard when it appears to be the distinct exception. I wouldn’t question the integrity of any of these doctors (pro or con), but it bares keeping in mind that it’s far from a slam dunk prognosis in terms of there being this great imminent danger. It think we tend to talk as if it is though. I suppose that’s somewhat understandable given the profound consequences that are being discussed. I’ve had/have spinal stenosis, 3 back surgeries, multiple fusions, 4 rods, 14 SS screws and from my point of view, there is no ethical issue. I used to have a risky job, bush pilot and big game guide in northern Alaska and it cost me physically, but I wouldn’t change it for anything, certainly not for the history of a 9 to 5 job, which I have now. Risk is inherent in everything we do, automobile accidents are one of the biggest injurers/killers out there. But to crawl in to a cocoon to avoid risk is to give up on life. I’m glad Jarvis Jones didn’t, his passion for the game of football wouldn’t allow him to and I don’t see him giving up on his dream anytime soon. People are worried about risk, but Jarvis Jones could end up in a wheel chair whether he plays football or not. I almost did, and I had no idea there was a problem. Fortunately I had gotten an MRI for my lower back that spotted the problem at T8-T11 and saved me from spending the rest of my life in a wheelchair with a diaper on. Even so, I haven’t quit doing the things that I love to do because something could happen at any time to put me in that wheelchair and I wouldn’t want to spend the rest of my life with regrets. Right now I deal with chronic pain and am on a regimen of pain killers to keep it at bay. I could easily go on Social Security and while away the rest of my life on the internet and television but that would be giving up. I work 40 hours a week in IT and take any overtime and travel I can get. I hit the gym once or twice a week to stay in shape and sometimes it cause me a lot of pain but I’m not going to quit. My doctor says she can “burn” the nerves in my upper back and neck to relieve the pain but there is a risk of losing function in my arms and it’s not a permanent solution but I’m not willing to take the risk. I’ll just deal with the pain. I’m not trying to make this about me, but to demonstrate the desire that many people with some kind of health issue or another refuse to let it dictate how they live their lives. Jarvis Jones is one of those people and I admire him for it. Spinal stenosis is not a death sentence as we can see from JJ’s time in Georgia. We have no idea why the USC doctors wouldn’t clear Jarvis, were they afraid of liability? Are California’s laws stricter than Georgia’s? Are east coast doctors better than west coast doctors? After all, some of the oldest, and best medical schools are on the east coast. None of know the answer to that question, but I would hazard a guess that they just weren’t sure enough about their diagnosis to clear Jones to play. I find it hard to believe that they actually thought Jarvis was at risk for a life threatening injury, especially since a local doctor, and doctors in Georgia did clear him to play. Maybe they had strict University guidelines to follow and couldn’t clear Jones to play, either way, without knowing exactly what the situation was, I don’t see that as an argument against him playing now. In fact, I would argue that Jarvis Jones diagnosis and subsequent treatment (if any) puts him at less risk because it’s managed. There will always be life threatening injuries in sports, and especially in violent sports like football and hockey. Just today a young man at Baylor died while practicing a back flip. He landed on his head and it killed him. Was it a freak accident? Or was he susceptible to just such an injury? No one knew, but we do know Jarvis Jones condition, and spinal stenosis can be managed. It’s not as if he has a weak back, but rather that the stenosis is a build up that puts pressure on the spinal chord, or the nerves where they exit the spine. In my case, my first surgery was a laminectomy where they went in and cleared out the passages where my nerves exited the spine and were being pinched. It was instant relief from sciatica but fortunately for me, the pain came back, because that’s when I had the MRI that spotted the deterioration of my mid-back. Deterioration caused from all those years of not taking the time to break things down in to smaller loads, or not taking the time to lift it right. IMHO, if Jarvis Jones is there at 25, and he is cleared medically, you draft him. He’s too much of a talent to pass up and the last thing you want is for San Francisco to pick him up and then make you pay for the next 6 to 10 years. I don’t want to see a foursome of Aldon, Patrick, Navarro and Jarvis rushing our QB or going after our RB. Not if the only reason you passed on him is because some doctors 3 or 4 years ago were unwilling, or unable to clear him to play. Not after you dumped him only to watch him leave and excel in the SEC. My only argument for his pick is litigation. Plain and simple. No way does Paul Allen (and lets be real folks, that’s who is seriously the only person at risk here) allow a player be drafted with this condition without another doctor putting his professional license and name with him. I don’t think Dr. James Andrews (and I know he’s not a back specialist of any sort) would even contemplate releasing a player into the field without some clause in the contract that releases liability from franchise and medical team to allow him play with due condition. That’s it. Roger Goodell spoke about his fears of an actual player dying on the field, Jarvis Jones actually has a condition (on paper) that could make this fear a reality. Jones would have to sign a waiver relieving the NFL, the team, and medical staff of any litigation from this condition should he suffer a serious injury in any related team activity/game. Bravo! You are a great example of Alaska spirit! Fight on. This is my attitude as well. Not sure Pete will take the chance, but Jarvis Jones is willing. If he’s willing, why deny him his dream? Thanks for the insight, Ivotuk. Brought a really different perspective to the debate. Awesome post ivotuk. Great perspective. I can’t argue with anything you said. I think it’s a great point that his condition can be monitored/managed. At least these professional athletes have access to the best doctors and medical technology in the world. Guys like Star L. might never have had the opportunity to learn of their heart condition for example without the exhaustive physicals they go through, especially if they don’t have health insurance. Anyway, I agree there’s no way he’s giving up his dream, and I can’t blame him for that. I see him as a FANTASTIC pick for our first round to play Will Linebacker. Why wouldn’t he be? What are your thoughts on Mathieu in round 3? I think he could be a great nickle corner and that PC/JS would consider the risk because of Mathieu’s ability to create turnovers. He’s still a pain in terms of the off field stuff. Personally, I’d let someone else take that chance. Which is ethically worse? To risk a man’s health knowing there is a chance he will be severely injured or to deny a man the chance to live his dream and obtain wealth beyond what he could with any regular job? Hard call right there. I’d let the man play as long as I sat him down, had a doctor tell him to his face what could happen, had him meet and associate with people that had experienced the worst of the injuries he could suffer, sign the waiver with multiple witnesses and notarized, and then if he still made the choice to play for his dream, I”d take the shot if I felt he was worth it. You only get one life and one shot at an extraordinary dream like playing pro football in the NFL. They may be able to catch problems with the spinal stenosis with constant monitoring and continue to make decisions as his career progresses. It’s very easy to include in a contract wording that if a doctor considers the condition to have reached a dangerous level, he must retire with a settlement. Very easy to do. Not sure we’ll take on the added work involved in that type of situation. Some team will. As long as they do the due dilience when signing Jarvis Jones, I say give the kid a shot. I am rooting for Jarvis Jones to be reunited with Carroll and Norton as a Seahawk. He’s easily worth the risk since most of a draft pick’s moneyball value comes in the first four years anyway. He’s more than productive, he’s special. Not a perfect prospect, but I think without the neck problem he might go #1 overall. I agree i would like to have him. But I think even without the neck issue he has flaws in his game that would push him to mid round one. Watching him his tackling can get very sloppy, in open pursuit of the ball carrier. Hes still a stud, who does look light and could possibly add 20 more lbs easily seeing that he’s not ripped by any means. I was wondering your thoughts on us drafting Jordan Campbell in a later round to compete at the MlL or WSL spot? Given his connection to Pete. Could definitely see it. Further depth, strong athletic dude.